Participants pose for a souvenir photo with Dr. Boy Fajardo, Mrs. Nenita Ma, and Sr. Carol Base after the training on traditional Hilot healing. MALAYBALAY CITY, Bukidnon- As a follow-up to the Hilot missions and presentations on Hilot done in this city last August 2013, a basic training on traditional hilot healing was conducted by Dr. Bibiano “Boy” Fajardo and ATHAG on January 22-25, 2014 at the Diocesan Pastoral Center. 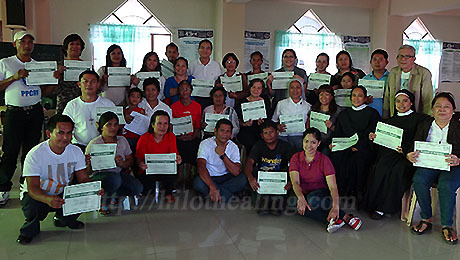 The training was realized through the tireless efforts of Mrs. Nenita Ma, a firm proponent of Hilot who worked hard to bring in ATHAG and the healing benefits of Hilot to her hometown, with the support of the Diocesan Commission on Health Care, ably led by Commissioner Sr. Carol L. Base, FdCC. Due to successive flight cancellations brought about by the inclement weather, the training was condensed into three days instead of five. There were 31 participants, composed mostly of practicing reflexologists and individuals interested in learning Hilot for their respective families. In the course of the training, the trainees were given an overview of the basic concepts and principles behind Hilot healing. They were also taught how to do traditional diagnosis by manually scanning the patient’s back, and feeling for variations in temperature and muscle quality, as well as bumps and lumps. Dr. Fajardo also discussed traditional herbal remedies for common illnesses. 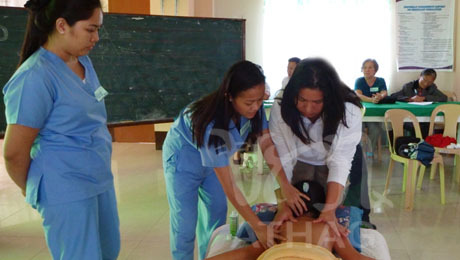 ATHAG Hilot therapists Jhen Dellosa and Mary Flor Alvarez demonstrated how to perform Hilot and supervised the participants as they practiced the strokes. ATHAG Hilot therapists Jhen Dellosa and Mary Flor Alvarez teach a mother how to do Hilot on her daughter. On the second day of the training, Dr. Fajardo introduced the “Valuing Process,” a procedure for attaining inner harmony which he developed by synthesizing tenets handed down by spiritual leaders of Mt. Banahaw, as well as maxims that the healers of old lived by. After the successful training, participants expressed their heartfelt appreciation for the knowledge they learned from Dr. Fajardo, which they could apply to improve the health of their families and clients. One participant, who hailed from a neighboring town, shared that there were no traditional healers in his area, and he was very happy to have learned what herbs they could use for specific ailments. The activity was capped off with refreshments and taking of photos. Are you interested in learning traditional Hilot healing? Contact the Association of Traditional Health Aid Givers Inc (ATHAG) at hilothealing121@gmail.com, or at (0922) 884 4568 or (02) 267 4012. You may also refer to the book, Hilot: The Science of the Ancient Filipino Healing Arts, by Dr. Bibiano Fajardo and Ma. Aleli Pansacola available at National Bookstore.